We will have a number of Dane ambassadors at this event for some Dane lovin’! Stop into our booth and see some of our Danes while you enjoy a delicious Boom Island brew! We will be at Chuck and Don’s in West St. Paul from 12-2 giving out some Dane love and doing nail trims for a $10 donation. Nail trims include dogs, cats, guinea pigs, lizards or whatever critter you’ve got! Come by and see us. On August 18th from 6:00 - 9:00, Stanley’s NE will be donating $1 per pint sold to UMGDR! Come see us and have a beer on the famous dog-friendly patio! Unmapped Brewery in Minnetonka, Minnesota will be donating $1 for every pint sold to UMGDR. They are dog-friendly indoors, so come see us! We will be at Bent Brewstillery showing off our wonderful Danes. Come and get your Dane fix! We will be at Chuck and Don’s in Elk River, MN from 12:00 - 2:00. Come and meet some of our gorgeous Danes! We will be offering nail trims at Chuck and Don’s in Plymouth, MN from 12:00 - 2:00. For a $5 clip or a $10 Dremel suggested donation, stop in to get your pets’ nails trimmed and visit with some our Dane representatives! We will be at Bentley’s Pet Stuff in Excelsior on March 30th from 12:00 - 2:00. Bentley’s is rounding up all transactions for UMGDR during the month of March! UMGDR will have a booth at this one of a kind event! We will be offering nair trims at Chuck and Don’s in Plymouth, MN from 12:00 - 2:00. Some of our very brave volunteers will be taking the plunge for these giants we love! Please consider pledging some of our volunteers by visiting https://www.firstgiving.com/event/forestlakerotary/winterplunge2019/participants, and choose the plunger you’d like to sponsor. Or you can visit our website at thegreatdanerescue.com, click the DONATE button and flag your donation for the Winter Plunge and a particular plunger. For a $10 suggested donation, stop in to get your pets’ nails trimmed and visit with some our Dane representatives! UMGDR will have a booth at the Doggy Depot within Union Depot in St. Paul, MN. If you have questions about adopting a Dane or even just want to pet some, we’ll have both human and Dane representatives there for you! Stop on by. Izzy’s Ice Cream will be donating $2 from every single scoop in a cake, sugar, waffle cone or cup to UMGDR! Other donations are welcome as well, but why not get some ice cream?! For a $10 suggested donation, stop in to get your pets nails trimmed and visit with some our Dane representatives! Do you wait until the last minute to shop? Come up to Barnes and Noble in Maplewood Mall and get your gifts wrapped! We are accepting donations for our efforts and will have some Danes available for snuggles as well! We will be wrapping gifts for donations at Barnes and Noble in the Maplewood Mall. We will, of course, have some Danes for snuggling, too! UMGDR will be at Holidazzle in Loring Park, Minneapolis from 11:00 - 3:00 in the Fulton Beer tent! We will even have some available foster dogs there to meet! Dogs will rotate throughout the day, so stop back often to see and pet them all! UMGDR will be hosting a nail trim clinic at the Plymouth Chuck and Don’s store. 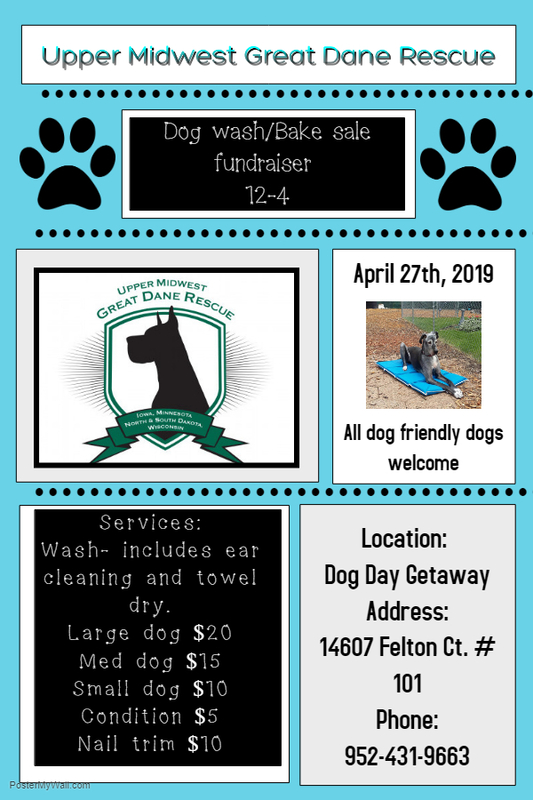 For a $10 suggested donation, come meet some Danes and get your dog’s nails trimmed! 2018 marks the 10 year anniversary of establishing the Upper Midwest Great Dane Rescue so we plan to make this year's picnic extra special! This is our annual picnic, so come one, come all! This event is open to volunteers, adopters, potential adopters, contributors and the general dog-loving public! Dogs of all shapes and sizes are welcome to attend as long as they and their humans are well behaved (and the dogs are on a leash). -Taco bar offered for lunch with bottled water. $5 donation to eat. There will be vegetarian and gluten free items available. The picnic will be at Thresher Fields Park in Eagan, MN. The picnic set up and events will be at the picnic shelter. Eagan's fence enclosed off-leash dog park is next to the picnic area. In honor of Dane County Dog Parks, Wisconsin Brewing Company is hosting the 2nd Annual "Barks for Parks!" celebration at their facility in Verona. This afternoon of fun will include live music, food, and entertainment for both two- and four-legged friends and family. Food will be available for purchase at the event.